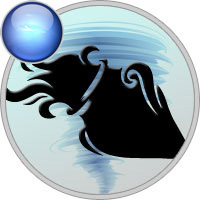 Neptune in Aquarius is humanitarianism at its best, since Aquarius adds some backbone to the sensitive qualities of Neptune. Neptune was in Aquarius for everyone on Earth from February 1998 through February 2012, the first time since the Civil War. In the Age of Pisces that ended in the mid 1900s, god was construed to be above and outside of man, and mankind below and inferior to god. With Neptune now in Aquarius you can discover that as consciousness you are god incarnate. One path to this realization is your total acceptance of the screwed up, karmically bound, dying human being that you are—without the previous guilt, sacrifice of personality, or self-denial of the Piscean Age. Through radical self-acceptance you can embrace your shadow and integrate the impotently angelic and uncaringly demonic polarities with which mankind has schizophrenically been identified for 2000 years. Illuminated and individuated as the total human being you are, you become that particular spark of the sun on Earth that was the promise of your birth. And the more of us that do this, the more that become fully human in awareness, the more this new Aquarian consciousness will reach critical mass and fuel all of mankind. This is the true promise of the Age of Aquarius.